These two suits are typical examples of the so-called "Chanel suits." 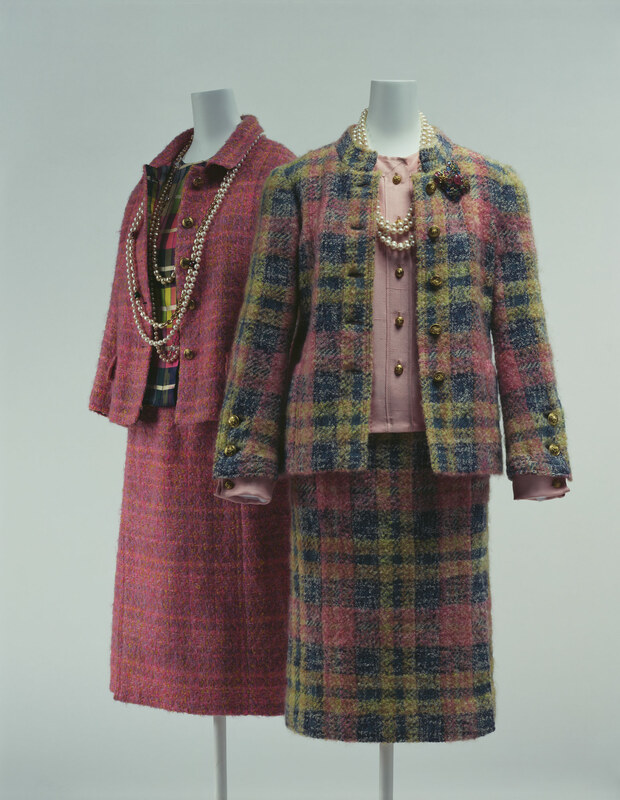 A jacket and a skirt of high quality wool tweed, a silk lining and a blouse made of the same fabric were the distinctive features of a Chanel suit. This high quality tweed has sufficient elasticity and is surprisingly light. Clothes of Haute Couture are often sometimes added lead weights at the bottom of hem to create a beautiful silhouette. Instead, Gabrielle Chanel attached gold chains inside the jacket. The Chanel suit, developed from her cardigan suit in the 1920s, was copied all over the world in the 1960s. It is because its simple structure was accessible to the prêt-a-porter era. The Chanel suit is worn considered as women's basic model in the 20th century and in the 21st century as well.